An ancient prehistoric village dating back 12,000 years has been found by Hebrew University archaeologists during excavations in the Jordan Valley. 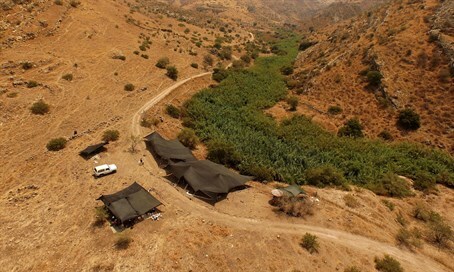 The site has been dubbed NEG II, and is located in Nahal (wadi) Ein-Gev at the middle of a perennial stream flowing west to the Kinneret (Sea of Galilee). Excavations there have found human burial remains, flint tools, art manifestations, faunal assemblage, ground stone and bone tools. The excavated area revealed an extensive habitation with deep cultural deposits (2.5 to 3 meters deep), and the site is estimated as covering roughly 1,200 square meters. According to the archaeologists the ancient village shows stark differences from others dating back to the same period in Israel, as it exhibits cultural characteristics from both the Old Stone Age (Paleolithic period) and New Stone Age (Neolithic period). "Although attributes of the lithic (stone) tool kit found at NEG II places the site chronologically in the Paleolithic period, other characteristics – such as its artistic tradition, size, thickness of archaeological deposits and investment in architecture – are more typical of early agricultural communities in the Neolithic period,” said Dr. Leore Grosman of Hebrew University's Institute of Archaeology, who led the excavations. "Characterizing this important period of potential overlap in the Jordan Valley is crucial for the understanding of the socioeconomic processes that marked the shift from Paleolithic mobile societies of hunter-gatherers to Neolithic agricultural communities,” emphasized Grosman. The archaeologists note that the Paleolithic period is the earliest and longest period in human history. The end of the period is marked by the transition over to settled villages and the domestication of plants and animals, in a shift to the agricultural life-style of the Neolithic period. In research published in the journal PLOS ONE, the archaeologists described the village as one of the latest settlements in the Levant region of the Late Natufian - the last culture of the Paleolithic period. Natufian culture, which lasted from around 15,000 to 11,500 years BCE, has been witnessed in sites spanning from the Negev and the Sinai in the south, up to Syria and Lebanon in the north. Describing the site, Grosman said, "the buildings represent at least four occupational stages and the various aspects of the faunal assemblage provide good indications for site permanence. In addition, the thick archaeological deposits, the uniformity of the tool types and the flint knapping technology indicate intensive occupation of the site by the same cultural entity." "It is not surprising that at the very end of the Natufian culture, at a suite of sites in the Jordan Valley, that we find a cultural entity that bridges the crossroads between Late Paleolithic foragers and Neolithic farmers." The announcement of the find comes the same Wednesday that it was revealed the remains of an ancient settlement from the Chalcolithic period roughly 7,000 years ago were unearthed in northern Jerusalem.